Ross is the Co-Founder, President and CEO of Gerber Kawasaki Wealth and Investment Management. Ross oversees Gerber Kawasaki's corporate and investment management operations as well as serves individual clients. Ross has become one of the most followed investors on social and in traditional media. His investment ideas and advice have made him a regular in the business news and he is featured on CNN, CNBC, Fox Business News, Bloomberg and Reuters as well as a contributing writer for Forbes.com. He has been ranked as one of the most influential investment advisors and Fintech innovators in America*. 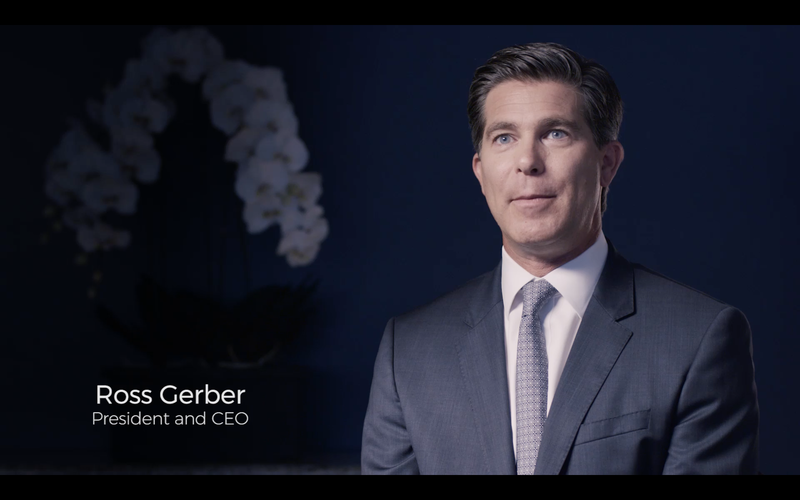 Ross and the Gerber Kawasaki team oversees $800 million of investments focused on technology, media and entertainment companies for clients and the firm. Gerber Kawasaki has grown to be a leader in Fintech by leveraging technology to work with a younger generation of clients. Ross is an expert in online marketing and social media as well as co-developed the company’s app for IOS. In 8 years since founding, Gerber Kawasaki has grown to 25 employees and from $50 mil to $800 mil of AUM as of 7/4/18. Ross received his BA in Communications from the Annenberg School at the University of Pennsylvania concentrating in Business Law at the Wharton School of Business, graduating class of 1993. Ross also received a second concentration in Classical Music Studies at the University of Pennsylvania and attended the Grove School of Music. Ross was born and raised in Los Angeles, CA and attended Brentwood High School with the graduating class of 1989. Ever since he was a child, Ross has had a passion for investing and music. He began learning and following investments as a 13 year-old after receiving Apple and Disney stock as a gift for his birthday. His passion for learning and investing grew as he followed the bull market of the 80's throughout his high school education. During college, Ross pursued his degree as well as his passion for music, forming several local bands. Upon graduating college, Ross returned to Los Angeles in 1994 and joined an independent investment firm affiliated with SunAmerica Securities. By 1997, he was managing a branch of 15 advisors in Woodland Hills, CA. In 1998, Ross received the Archon and Million Dollar Branch Award**. At age 27, he was the youngest million dollar branch manager in SunAmerica's history. He was promoted to vice president and COO in March of 1999 and began overseeing 15 branches and over 200 advisors for SunAmerica securities. In 2008, the financial crisis caused the collapse of several major financial institutions and the government bailout of others, challenging the existing state of affairs within the financial industry. Navigating these trying times, Ross understood the importance of focusing on the client's best interest utilizing a modern and unbiased approach to serving the client community. It was during this time that Ross developed his vision for a new type of investment firm. In 2010, Ross and his business partner, Danilo Kawasaki, felt it was the opportune time to start their own firm, Gerber Kawasaki, aligned with this client-centric mission. Built on the mission to provide clients with customized, objective financial advice, Gerber Kawasaki began with a core group of advisors and specializes in working with two groups of clients, baby boomers and Generation X/Millennials. Ross and Danilo started Gerber Kawasaki with the goal of using online advertising, social media and their financial application, My Money Page, to attract new clients and enhance the client experience as well as to focus on a new market for financial advice, Generation X/Millennials. While maintaining their traditional wealth management business focusing on helping baby boomers plan for retirement and protect their families, Gerber Kawasaki also serves a younger generation of clients through their wealth building program. Ross currently resides in Brentwood Park, CA with his family and is on the executive board and is most recent past President of the charitable organization, The Guardians of the Jewish Home. He continues to play music and perform in his free time with his band, The Danger Band. *ranked 2017 Investopedia, ranked from richtopia 2017 blockchain innovators list.